The Volvo XC90 makes an excellent tow vehicle and when fitted with the Hayman Reese quick release tow hitch it is rated up to 2250kg max trailer weight. A notch is cut into the bumper to allow the receiver box to pass through while hiding the rest of the installation behind it. 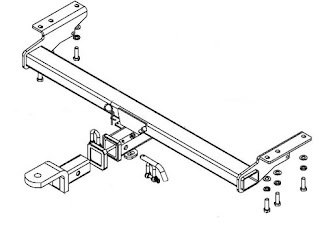 The towbar securely attaches to the XC90's chassis rails with three 12mm bolts each side giving a strong towing platform. Finally the electric hook up to run trailer lighting takes a bit of care on this vehicle and requires a control unit to protect the vehicles ECU and prevent interference with the vehicles bulb failure detection system. 2011 UPDATE: Hayman Reese have now developed a vehicle specific wiring loom for this vehicle which simply plugs into the light circuits and incorporates an ECU distribution box to protect the cars electronics. 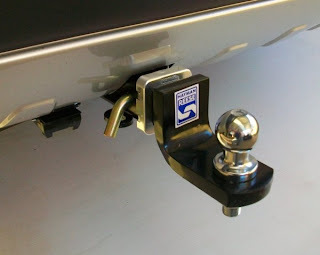 See our towbar finder for current fitted price. You should allow about 3 hours for fitting. Give us a call at the shop on (02) 9817 1475 to schedule an install or pop in and see us (map).